CUTTING ties with contracted captain Steven May was Gold Coast's line-in-the-sand moment as the Suns try to "break the cycle" in the retention battle, list manager Craig Cameron says. May became Gold Coast's solo skipper after Stuart Dew and his football department stripped outgoing co-captain Tom Lynch of that privilege once he announced he was leaving in early August. The double whammy of May and Lynch departing for Melbourne and Richmond, respectively, follows previous captain Gary Ablett walking out on the club last year to return to Geelong. Kade Kolodjashnij was part of the May deal that sent both to the Demons for pick six, while the No.7 choice two years ago, Jack Scrimshaw, and Aaron Hall were shipped to Hawthorn and North Melbourne, respectively. The star power marching out of Metricon Stadium across the years also includes Adam Saad (2017), Jaeger O'Meara and Dion Prestia (2016), Charlie Dixon (2015) and Josh Caddy (2012). "Once we got in a position where both captains weren't ready to commit to us long term, we had to change the strategy of the football club, because we needed to break the cycle," Cameron told NAB AFL Trade Radio. "It was a strategy we took to, ‘clear the decks’ is the wrong term, but to actually get some clear air and build a club from a base of bringing in some really good character people. "A lot of what's going to happen with us going forward; we'll get some high-end draft picks and some really talented young players, and they need to come into the right environment and grow from there." Cameron said the decision to part ways with May came after a "big debate" at board and football department level, and after that the priority was about scoring "the right recompense". The Suns have an extraordinary draft hand this year, with picks two, three and six, as well as 24, 29 and 80. They've been here before: four of the top-10 selections in 2016, and eight of the first 13 picks in their inaugural 2010 draft. Cameron, Dew and football boss Jon Haines all arrived about a year ago and have set about changing the culture, effectively clearing the dead wood and picking specific incoming types. Gold Coast's newcomers in the past fortnight are Jack Hombsch, Anthony Miles, Corey Ellis, George Horlin-Smith and state league standouts Josh Corbett, Chris Burgess and Sam Collins. They arrive 12 months after three other players similarly starved of opportunity or off the AFL scrapheap: Aaron Young, Nick Holman and Harrison Wigg. Several of them will help shield the likes of young midfielders Will Brodie, Jack Bowes, Brayden Fiorini and Ben Ainsworth, alongside David Swallow, Jarryd Lyons and Touk Miller. "We need to change our football club so that we don't have guys coming towards the peak of their career that want to leave," Cameron said. "Free agency can hurt clubs like ours, but not if we get our off-field right. "If we start to get the off-field right and start to drive the club in the right direction, we hope those things will turn around." South Australians Jack Lukosius and Izak Rankine loom as two of the Suns' draft options, in spite of Port Adelaide list manager Jason Cripps' warning they would quickly try luring them home. Cameron refused to bite back at the comments, saying Cripps rang him in the aftermath to apologise. 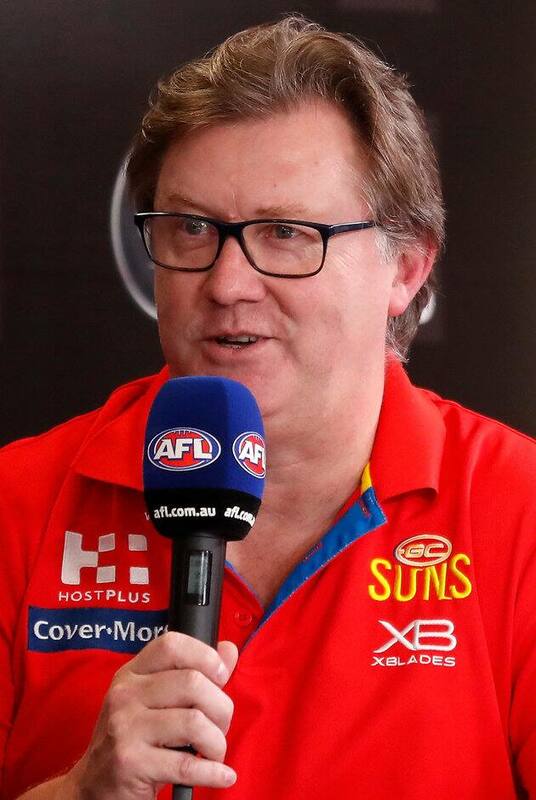 There are likely to be negotiations between Gold Coast and the two South Australian clubs about potential top-10 pick swaps in the coming weeks.